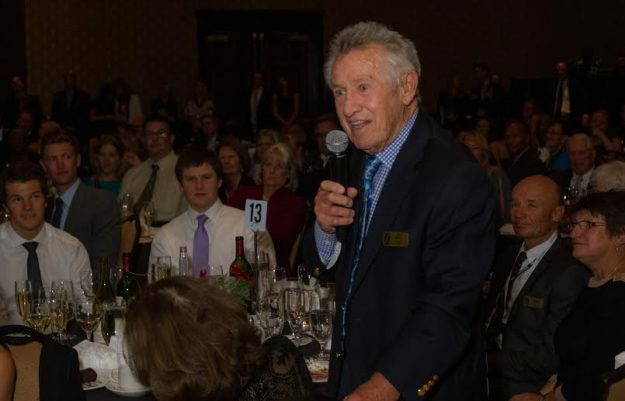 Bob Beattie at the Colorado Ski Museum Hall of Fame induction gala in October of 2013. The legendary ski industry figure died Sunday in Fruita at the age of 85 (Colorado Ski H& Snowboard Museum and Hall of Fame photo). According to the Aspen Times, legendary ski-industry broadcast and ski-racing innovator Bob Beattie of Aspen died Sunday at his son’s home in Fruita. Beattie was 85. In honor of Beattie, here’s are a couple of re-posts of 2013 and 2014 stories I did for the Colorado Ski & Snowboard Museum here in Vail. The stories also ran in the Vail Daily. U.S. Ski and Snowboard also put out a press release on Monday (see below). December 13, 2013 — At age 80, Aspen’s Bob Beattie still likes to stir the pot, especially if it bubbles over on ski racing’s European establishment. That’s the approach “The Coach” took in the late ’50s when the former Middlebury football player and skier took over as ski coach at the University of Colorado and won two NCAA titles with mostly homegrown talent as opposed to the European imports at rival University of Denver. That’s the approach he took in the early ’60s when he coached the first U.S. Ski Team to relevance with the first Olympic medals earned by American men (slalom silver and bronze for Billy Kidd and Jimmie Heuga) at the 1964 Winter Olympics in Innsbruck, Austria. And that’s the approach he took in the ’70s and ’80s when he founded the World Pro Ski Tour that allowed racers to break away from amateur rules and the constraints of skiing for national teams and gave them the chance to earn prize money in a head-to-head format with jumps. Having done so much to build the sport over the past five decades – especially in America — Beattie says the future is bright given the high level of current and upcoming talent, but he’d still like to see more innovation led by North Americans. Since the early ’90s, the FIS (International Ski Federation) World Cup tour, which Beattie helped found in 1966, has steadily reduced the number of races in North America, with venues like Park City, Utah, and Whistler, British Columbia, dropping off and only Lake Louise, Canada, Beaver Creek and Aspen still on the circuit. This season Aspen was skipped so the women could instead try out the new Raptor course for the 2015 World Championships at Vail and Beaver Creek. Aspen will host again next season. Still, Beattie isn’t about to stir up any kind of Vail-Aspen rivalry. In fact, Vail founder Pete Seibert and his marketing guru Bob Parker invited Beattie’s squad to train on the new mountain its first season in 1962-63. Beattie thought the only hope the U.S. had of taking down the mighty Austrians and French was to be more physically fit, so he drove his athletes relentlessly in the off-season and brought a football-like fanaticism to training. He also over-promised and under-delivered to American and European ski-racing fans, guaranteeing victories in every discipline. “We put it upon ourselves to do well and the challenge was there and the pressure was there from a lot of people at home who didn’t particularly like us that much, especially old ski racers and Olympians who were all over us,” Beattie said with a chuckle. Kidd and Heuga came through in the final event of those ’64 Games, and Beattie coached at one more Olympics in ’68 before he launched the pro tour and worked as a broadcaster for ABC at four more Winter Olympics, including Franz Klammer’s hair-raising downhill at the ’76 Games. Beattie also headed up NASTAR for recreational ski racers and founded the Buddy Werner League for young racers. He was inducted into the Colorado Ski & Snowboard Museum Hall of Fame in 1986. February 8, 2014 — To say there was a little pressure on the American men heading into the final alpine event of the 1964 Winter Olympics in Innsbruck, Austria, is a massive understatement. American women had piled up seven medals (three gold) in the five Olympic Games leading up to Innsbruck, including three silvers on home snow at Squaw Valley in 1960. The American men were shut out of the medals at Squaw and had been blanked at all five Games since alpine skiing debuted in 1936 at Garmisch, Germany. Steamboat’s Buddy Werner, the greatest American racer of his day, had broken his leg training at Aspen two months before Squaw, so at age 28, he went into the ’64 Olympics on the downside of his storied career – still seeking that elusive first U.S. men’s medal on the sport’s greatest stage. Then there was the coach, hard-charging Bob Beattie — a former football coach turned two-time NCAA champion ski coach at the University of Colorado. Beattie was brash, driven and intensely demanding of his athletes. He also pulled a Joe Namath five years before the Jets’ quarterback guaranteed victory over the Colts in Super Bowl III, promising men’s medals. But so far at the ’64 Games, the American women had done their usual part, with Jean Saubert collecting a bronze and a silver in slalom and giant slalom (GS), but the men had once again missed the podium in the downhill and the GS. Beattie desperately needed a medal of any color when his four American men — William Winston “Billy” Kidd, Jimmie Heuga, Chuck Ferries and Werner — took to the snow for the closing slalom on Feb. 8, 1964. Kidd and Heuga wound up claiming silver and bronze, with Kidd just .14 seconds from Josef “Pepi” Stiegler’s gold-medal time and Heuga just .39 behind in the first Winter Olympics in which times were calculated to the hundredth of a second by IBM. “I missed the gold medal in the Olympics by 14 hundredths of a second, and then I spent six years trying to make up 14 hundredths of a second,” said Kidd, who finally got his gold at the 1970 World Championships and went on to become Steamboat’s iconic, cowboy-hat clad director of skiing. Kidd also won the overall title of the inaugural World Pro Ski Tour, which Beattie founded in 1970. “(Beattie) changed the sport in America and certainly changed our lives,” added Kidd, who was 20 when he won his medal 50 years ago Saturday. Ferries, the first and still only American to win the Hahnenkamm slalom at Kitzbuehel, Austria, crashed and was disqualified in that ’64 Olympic slalom. But Werner — the first and still only American man to win on the full-length Hahnenkamm downhill course — wound up eighth. Marolt never again raced in the Olympics, but instead went into coaching. His CU ski teams won seven national titles in 10 years. Bill Johnson and Phil Mahre finally won U.S. men’s gold medals when Marolt coached the U.S. Ski Team at the 1984 Sarajevo Olympics, and CU won a national championship in football when he became athletic director. Now the outgoing president and CEO of the United States Ski and Snowboard Association, Marolt has presided over the most successful U.S. ski teams ever. His “best in the world” mantra drew heat from European ski powers during the 2006 Torino Games, but at the 2010 Vancouver Olympics, the record American medal haul proved his point. Call it bravado, call it determination, but Marolt says he got it from Beattie. “A lot of the things that I do today are lessons I learned going clear back as an 18-, 19-, 20-year-old,” said Marolt, who credits Beattie with originating and executing the concept of the U.S. Ski Team. He credits Werner, Kidd and Heuga with laying the foundation for future success. “Buddy coming out of Steamboat Springs and going to Europe, battling away, attaining the results and getting the respect of the international press and becoming an international star,” Marolt said. He said that the successes of skiers such as Werner, and the trials of Heuga battling multiple sclerosis, motivated and inspired future ski racers. An icon of the sport of alpine ski racing and one of its most passionate pioneers, Bob Beattie passed away Sunday (April 1, 2018) with his family in Fruita, Colorado. Beattie, 85, was the founding coach of the U.S. Ski Team and one of the originators of the Alpine Ski World Cup. He was a driving force for ski racing his entire life and among sport leaders who built alpine ski racing into one of the pillar events at the Olympic Winter Games. Beattie, known often as ‘Beats’ or simply “Coach,” became well known as a commentator for ABC Sports and ESPN, working for ABC at four Olympic Winter Games. Beattie, who moved to Aspen, Colo. in 1970 and lived for many years in nearby Woody Creek, was born in Manchester, N.H. January 24, 1933, later attending Middlebury College in Vermont where he was a multisport athlete. He was named acting ski coach for Middlebury after graduation in 1955, standing in for coach Bobo Sheehan who went on to coach the U.S. Ski Team for the 1956 Olympics. Beattie took his Middlebury team to the NCAA Championships at Winter Park, Colo. finishing third and attracting the attention of other college programs. In 1957 he became the head ski coach at the University of Colorado, leading the Buffs to NCAA titles in 1959 and 1960. In 1961 the National Ski Association named Beattie as its first national team coach. He embraced that role, providing the formative direction to organize the first true national team with heavy promotion leading up to the 1964 Olympics at Innsbruck. The USA won an unprecedented four alpine medals including silver and bronze by the late Jean Saubert, as well as the first men’s alpine medals in Olympic history for the USA with Billy Kidd taking silver in slalom and the late Jimmie Heuga bronze. Among the heroes of the sport in that era was Steamboat Springs, Colo. native Buddy Werner, who became the first American to win the fabled Hahnenkamm downhill in Kitzbuehel, Austria in 1959. Recognizing not just his athletic prowess but also his leadership skills, Beattie recruited Werner to ski for him at Colorado and the two became close friends. Beattie accompanied Werner’s body back to America after his tragic death in an avalanche in Switzerland just after the 1964 Olympics. In his tenure leading up to the 1964 Olympics, Beattie often stirred controversy. But he also pioneered a new era of promotion and fundraising for the fledgling U.S. Ski Team. He partnered with the U.S. ski industry to raise funds and engaged with corporate America to support its national team at previously unheard of levels. One of the sport’s greatest promoters, Beattie partnered with journalist Serge Lang and French coach Honorė Bonnet in 1966 to align the leading ski races around the globe in the first Alpine Ski World Cup. The tour quickly earned the nickname of the White Circus as stars of the sport hopscotched the globe every weekend, quickly growing to become one of the most notable international sports tours. A half-century later, the tour continues to bring alpine ski racing to hundreds of millions of fans globally every year. Today, the World Cup tour concept is common among winter sports – all emanating from the Lang-Beattie-Bonnet concept. After leaving his coaching career, Beattie started World Wide Ski Corp., pioneering the World Pro Ski Tour in 1970. Strong national television coverage prompted top international athletes to flock to America including triple Olympic gold medalist Jean-Claude Killy and American stars like Spider Sabich. The tour continued until 1982. At the same time, Beattie also took over promotion of the relatively new NASTAR recreational racing program that had been started by SKI Magazine editor John Fry in 1969. NASTAR continues today, now under the leadership of the U.S. Ski Team, bringing the sport to thousands of new participants at resorts coast-to-coast. Beattie made his debut as a television commentator in 1969 working for Roone Arledge at ABC. He was later paired with NFL football star Frank Gifford. Their call of Austrian Franz Klammer’s gold medal downhill run became legendary. He went on to work Winter Olympics in 1976, 1980, 1984 and 1988, as well as the 1984 Summer Olympics in Los Angeles. He was a frequent host on ABC’s Wide World of Sports as well as on ESPN where he produced Bob Beattie’s Ski World. He is one of the most decorated officials in skiing. The then U.S. Ski Association awarded Beattie its highest honor, the Julius Blegen Award, in 1964 for his leadership in forming the U.S. Ski Team. He was awarded the AT&T Skiing Award in 1983 for his lifetime contributions to the sport. He was inducted into the U.S. Ski and Snowboard Hall of Fame in 1984 and the Colorado Ski and Snowboard Hall of Fame in 1986. The U.S. Ski Team and International Ski Federation presented Beattie the FIS Journalist Award in 1997. He was honored with the U.S. Ski Association’s Russell Wilder Award in 2000 for his contribution to youth through NASTAR. In 2012, athletes from seven decades paid tribute to Beattie at an event organized by the World Pro Ski Tour Foundation at the Hotel Jerome in his adopted hometown of Aspen. During the Alpine Ski World Cup Finals at Aspen last March, he was the focal point of a 50 Years of Ski Racing tribute. After retiring from his broadcast career, Beattie remained passionately engaged in the sport. He was ski racing’s biggest, and its most outspoken critic. He continued to be an advocate for change. In recent years his passion led the U.S. Ski Team to create the Bob Beattie Athlete Travel fund, which is now funneling millions of dollars into an endowment to help national team athletes. In 1986 Beattie drove negotiations with the Aspen Skiing Co. to provide affordable skiing for kids in the Roaring Fork Valley. The result was the ASK program (Aspen Supports Kids), now called Base Camp. The program thrived and today serves 1,800 kids with affordable entry into the sport. Beattie married four times. He had a son, Zeno Beattie, daughter Susan, six grandchildren and eight great-grandchildren. Among Beattie’s credits are several books including My Ten Secrets of Skiing (Viking Press, 1968) and Bob Beattie’s Learn to Ski (Bantam Books, 1967). He also had a cameo role as a German skier in the television series Combat with Vic Morrow in 1964 as well as in the 1987 Sylvester Stallone film Over the Top. Details on a celebration of Bob Beattie’s life are pending, but will likely be this fall in Aspen.